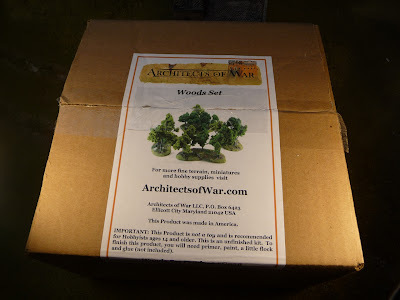 I buy a lot of wargaming "stuff", so I thought I would start a new feature on my blog related to service and quality. I will make this an ongoing effort, but will not make it retrospective, so any company that has screwed up in the past is forgiven. The label will be "plugs", bad or good. I will give one of 4 ratings: Recommend without reservation; Recommend; Recommend with reservation; Do not recommend. I should note that I am not interested in rating the price as I find it has no association with value. Value is a very personal thing and just can not be rated. I will say though that this company sells Perry plastics at quite a good discount. I will also discuss price if there is a big difference between different sellers. Well I just received a package from Architects of War, a new company in Maryland that makes their own terrain items but also sell other wargaming supplies, including Perry Plastics. I heard about them from Miles in the blogspot Lair of the Ubergeek. 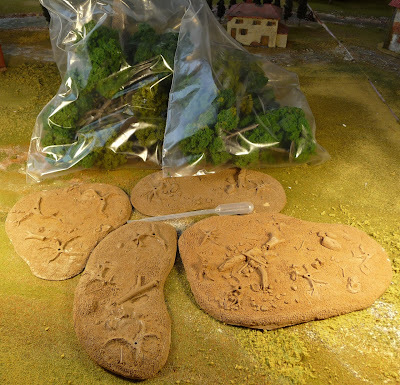 I ordered their latest terrain item, some tree bases. I placed the order in the morning of Oct 22, got a confirmation of shipping in the afternoon of the same day and received the order on Oct 25. Please note that the 22nd was a Friday. There was no charge for shipping, so I really can only be quite pleased with this. I bought the 4 base with trees set, and as you can see it was nicely packaged. I always feel it is important for a new company to give some thought to personalising their packaging and no complaint here. The contents included 4 unpainted bases and a bunch of trees. I was shocked to see that the Woodland Scenic trees were already assembled. 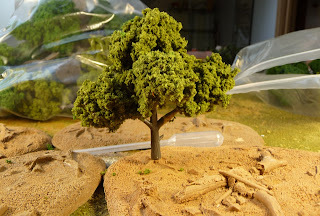 I was very pleased with this, as I find glueing these trees together quite a challenge, so all I really have to do is paint the bases and tree trunks. Fantastique! As you can see the bases are quite detailed and are quite solid. A little pipette is included to help apply the scenic cement, a nice touch. 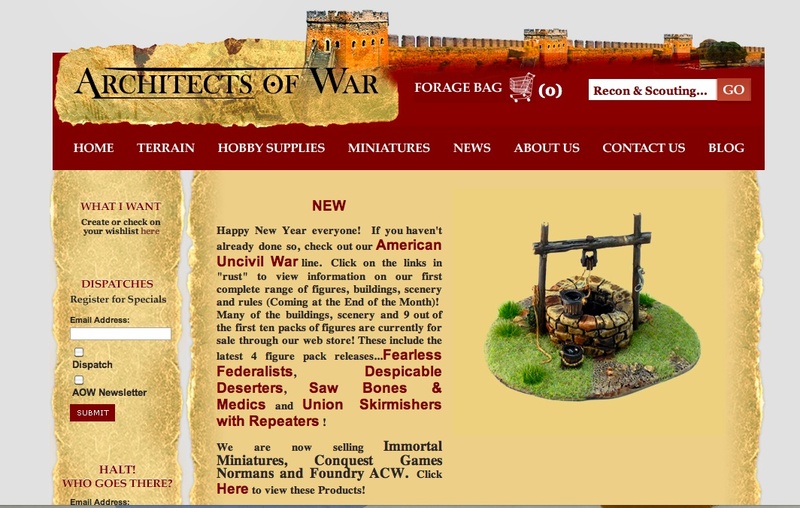 One great thing about their website is their "How Do Guides", here is a link to the instructions for the Woods Set. This is quite well written in an easily understood style in a well presented PDF. I would also refer you to their road making PDF, which looks quite interesting, but not yet attempted by myself. Well I believe I have solved my tree terrain problem, one base will suffice for a clump of trees while multiple bases placed together will make very nice forests. Placed together, the 4 bases make a approximately 12"x 12" quadrangle. 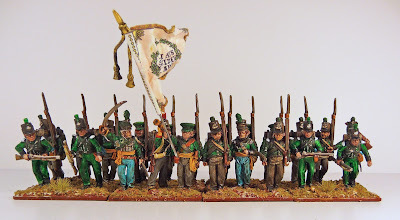 This is the first unit that I have finished for my Hanoverian Allied Brigade for Lasalle. The brigade is modeled on the 1st Hanoverian Brigade under Major General the Count Kielmansegge, 3rd Division, First Corps of Wellington's army at Waterloo. 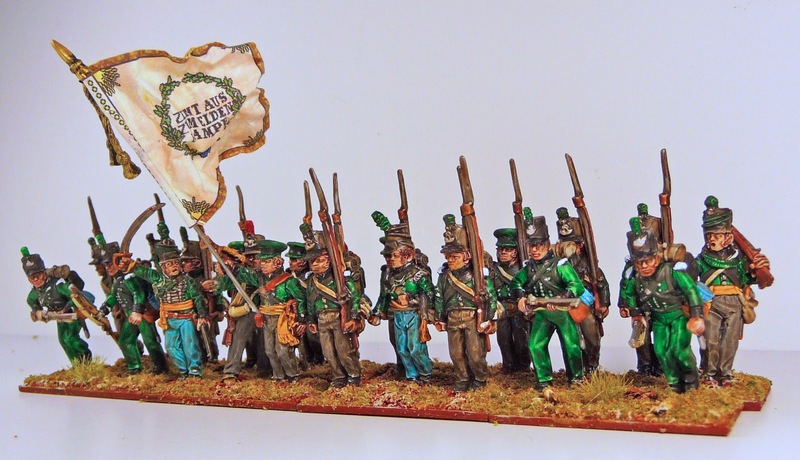 I picked this unit do first as I had the figures on hand (or I thought I did) and I need the unit for my Hougomont project. 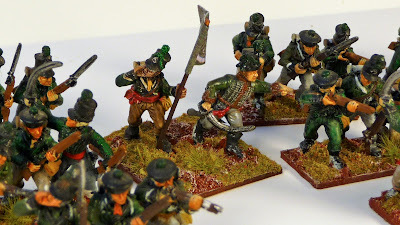 I will use 3 manufacturers for this brigade, Perry have a line of Hanoverian figures. They are quite nice figures although they have an enormous mount of flash. 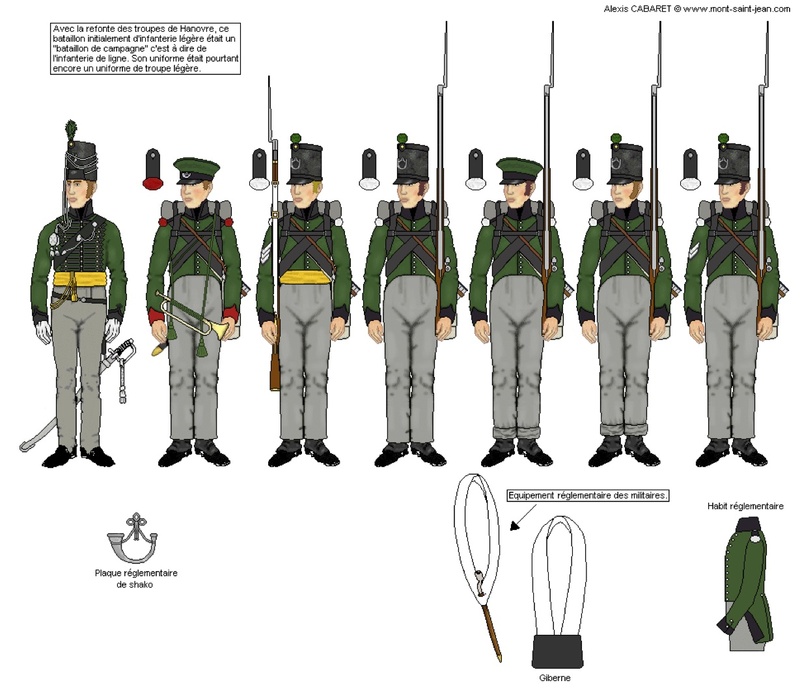 I will use the Perrys for the Lueneberg and Grubenhagen light battalions and the Bremen field battalion. 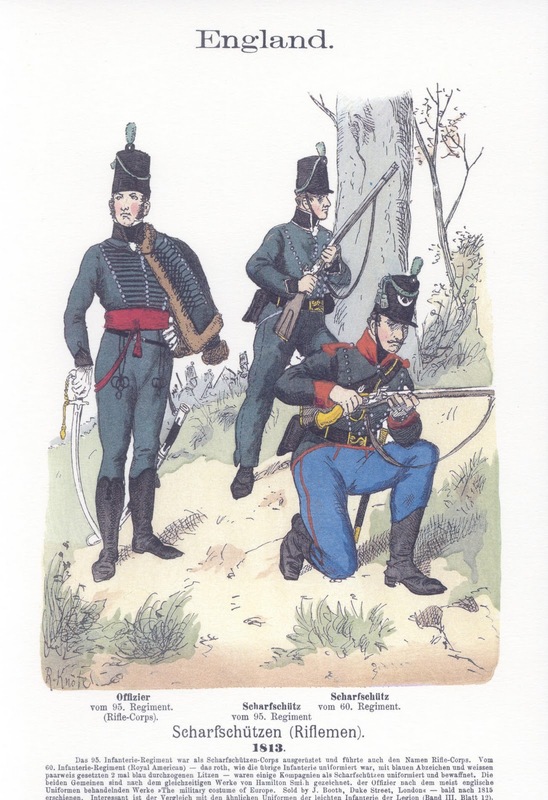 For the other 2 field battalions I will use Victrix figures, with their Hanoverian heads. 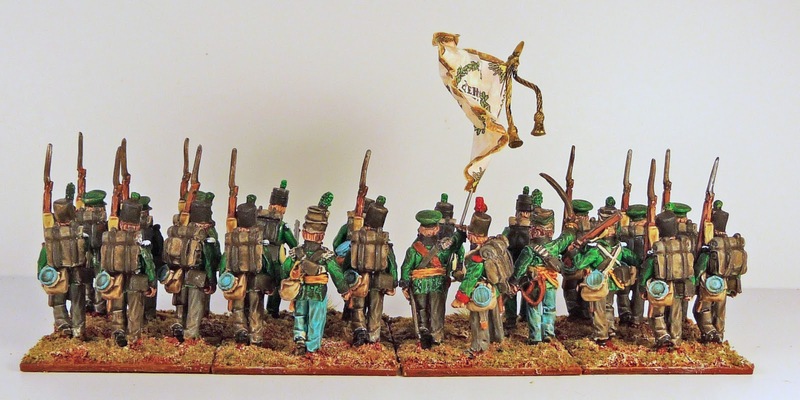 For the Jagers, I have decided to be a little inaccurate and use some Calpe figures that I had painted up as Kielmansegge's Feldjägers for my Wallmoden project. 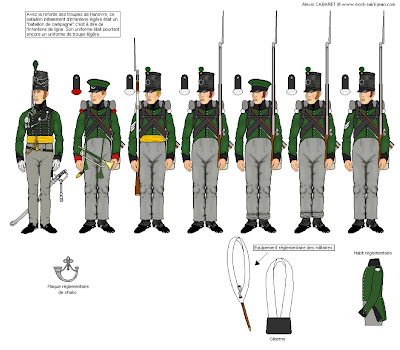 I realise the jägers in the 1st Hanoverian Bde had rifle uniforms, but the Calpe are very nice figures. Anyway here is the OB, I will have to think a little more about their ratings, so have yet to assign them. I used the Mont St Jean site as the reference for the uniforms, clearly so have the Perry brothers. Here is their plate for the Grubenhagen light battalion. Here also is a TMP link, which I believe to be quite an accurate accounting of the Hanoverian uniform in 1815, look at John Franklin's post. 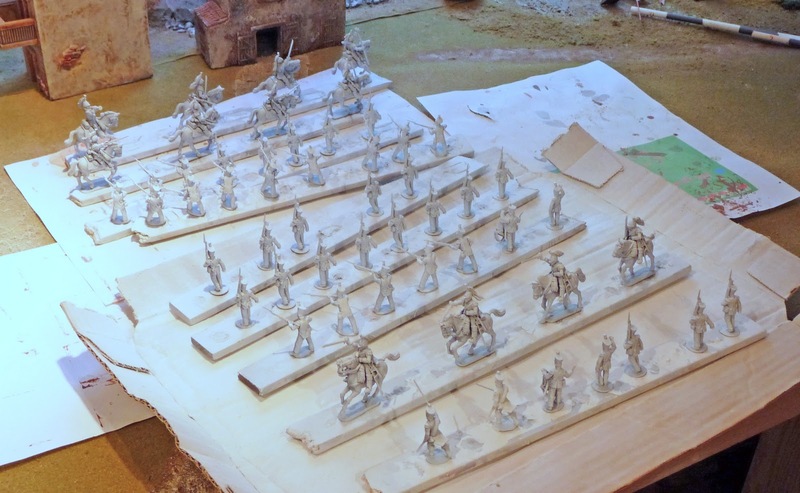 So good so far, but as I was painting my last 6 figures, that these were actually for the Lueneberg light battalion. I wanted to mix field caps with shako's but when I was putting the final touches on the figures, I noticed that the capped figures had 3 rows of buttons rather than 1. I have shoved them in anyway until I get some mores figures, not a big deal as I was planning to paint the Lueneberg next anyway. For my Hougomont project, I need to break off the light companies from these 2 units, so I decided to use the Perry rifle figures for these 4 bases. These are much more dynamic figures, the specific Hanoverian figures are a little static. Flag View, I know, no flag, but I like flags. No idea whether this is right or not, from Flag Dude. Command Figures, I really thought these were quite nice figures. Kielmansegge's Feldjãgers. 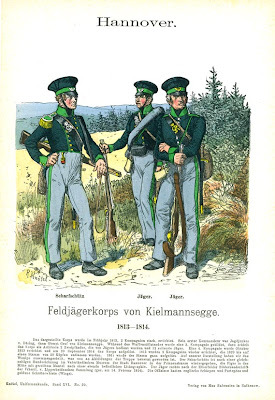 Here is a Knõtel print, of what they looked like in in 1813-14. So I used Calpe figures, as they seemed at the time a good fit. They are not bad, although the earlier reference I had, described a brown rather than a green cap (I like the brown a little better). Also of course the cuffs are wrong and what I did not notice at the time, is that they have muskets rather than rifles. Great figures though, really my favourite to paint. So whats next, well I really have to do the hard graft of painting up at least 3 more french battalions of legere. Here are 2, and also a little treat, some cuirrassiers. If you are going to do Hougomont, it is just as well to plan for La Haie Sainte as well! 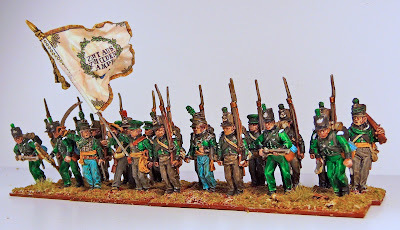 When I started painting napoleonic figures about 4 years ago, there was little information on the internet, I do not remember seeing any blogs and very few manufacturers had decent web sites. Since then the information growth has been exponential. 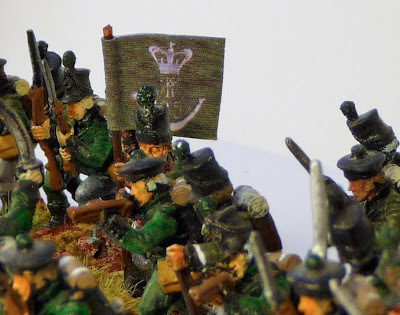 Being a solo wargamer, I find having a blog is just great. It keeps me in touch with other wargamers, I see what others are doing and I get all kinds of great ideas on how to do things. One thing I have tried to do on my site is put up some comparison shots of different manufacturers. 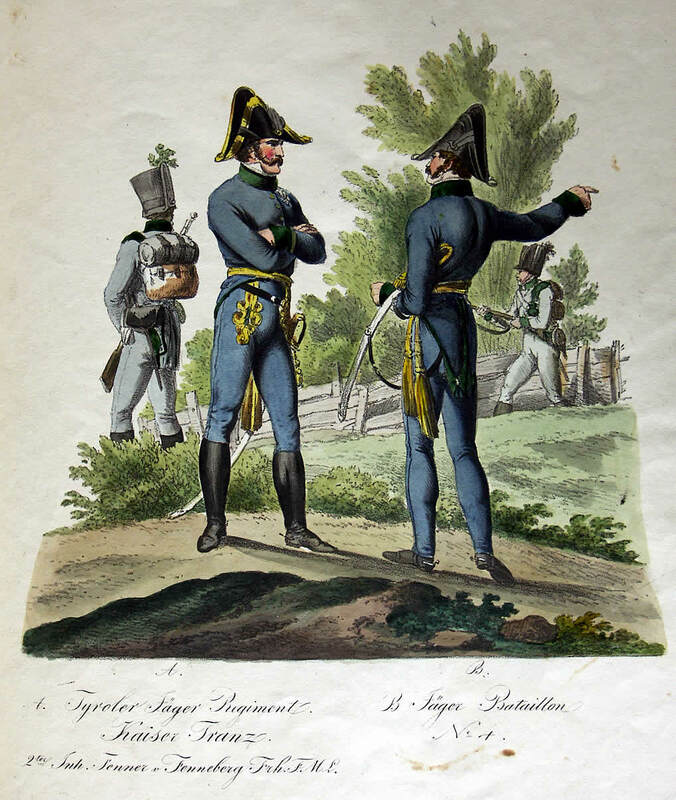 Today are some French mounted infantry chefs d'batallion. Here we have five different manufacturers. Please try not to judge their quality by my painting job. These have been painted over a 4 year period with the Perry chef d'bataillon and the Foundry lègere colonel figure being the most recent. They are all nice figures and I have no problems recommending any of them. I hoping to soon put up some photos of some buildings I have acquired, this is a really tricky area as the different manufacturer described sizes have absolutely nothing to do with their actual sizes. A few months ago, I discovered Maverick Flags, so I thought I would post a photo of my latest acquisition. Now, I am well aware that light regiments usually do not have colours. But what is a wargaming unit without a little flag. The great thing about Maverick is that Stuart knows that all units need colours, so he had one for the 95th. I had already purchased the colours for the South Essex, so I knew Stuart's flags are of great quality. It was with impatience that I waited for my flags to arrive from overseas. So here we go, the 95th in skirmisher order with their new pennant. Here is a nice close up, you can see that it is a linen flag that is especially nice. I am not sure where Stuart got the design from, but it is very similar to the one in the TV production of Sharpes Eagle. 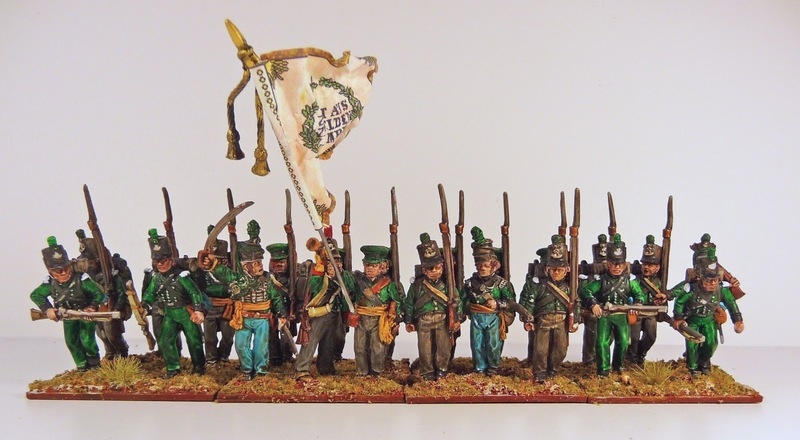 Front Rank, of course, does not provide a flag bearer with their rifles figures, so I had to "cut one up". This is one of their sergeants. I removed his rifle and filed a groove in his hand for the pole. It came out pretty well. It also illustrates the improvement in my painting style, the rest of the figures were painted about 2 years ago, and our pennant bearer was done yesterday. It is nice to know that painting miniatures can be learned. I know my method is not a traditional one, but I am really starting to quite like my figures.